Princess Cruises first began cruising to Alaska on June 3, 1969 with Princess Italia carrying 525 guests to this breath-taking destination. On having completed 50 years of sailing, the cruise line is introducing new entertainment, shore excursions and culinary offerings to mark this significant milestone. New programmes will be available on board seven Princess Cruise’s ships sailing in Alaska for the upcoming May through September season, marking the cruise line’s largest deployment ever and featuring the debut of Royal Princess, the first time a Princess MedallionClass ship will be sailing in Alaska. Princess offers a variety of cruise and cruise tour options highlighting the state’s must-see attractions, including Glacier Bay National Park and Denali National Park. 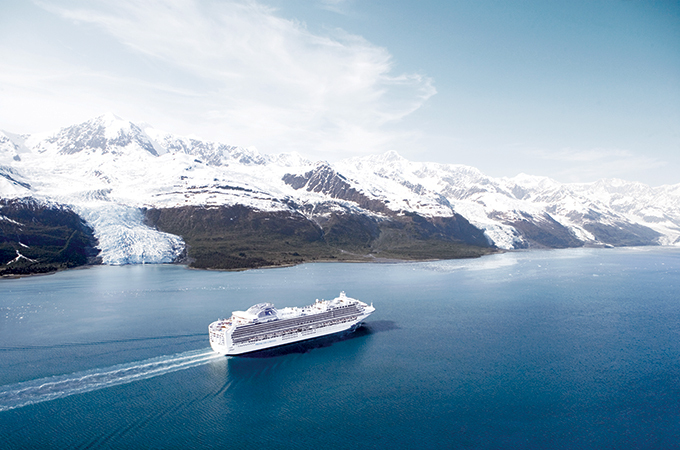 Alaska cruises range in length from seven to 12 days and depart from Vancouver, Anchorage (Whittier), Vancouver, Seattle, San Francisco and Los Angeles. Princess also owns and operates five wilderness lodges nestled in scenic riverside locations near National Parks offering more than 20 unique cruise tour options for guests. Princess cruise tours highlight the best of Alaska by combining a seven-day cruise with a multi-night land tour and exclusive “Direct to the Wilderness” rail service – giving travellers a seamless Princess vacation experience in the Great Land. New for 2019, as part of the Alaska cruise tour offerings, is the grand opening of Fannie Q’s Saloon at the Denali Princess Wilderness Lodge. This new restaurant and bar named after famed Alaskan pioneer, Fannie Quigley, will showcase her story and locally inspired dishes in a modern saloon setting, serving breakfast, lunch and dinner. Just outside of Fannie Q’s Saloon, the new Fireside Patio also debuts with three fire pits offering a new gathering place for guests to roast marshmallows, talk about their adventures and have a drink in the midnight sun. Last, newly named Grizzly Burger offers a fast-casual restaurant serving up the cruise line’s award-winning “Ernesto” burger, named “Best Burger a Sea” by Cruise Critic. This uniquely crafted ribeye burger was created exclusively for Princess by burger expert Chef Ernesto Uchimura. An exclusive treehouse experience at the Mt. McKinley Princess Wilderness Lodge built by Pete Nelson of Animal Planet’s Treehouse Masters offers guests the ultimate Denali view in an unforgettable setting. Gazing up at the Northern Lights is an unforgettable natural phenomenon. Now, guests have the opportunity to enter the indoor planetarium in the Princess Theater and look up at this aurora, a natural and colourful light display. From naturalists, to a “Deadliest Catch” fisherman captain, to a world champion lumberjack and the first female winner of the Iditarod, guests will meet with local experts and hear first-hand how Alaska’s unique environment has fuelled their lifestyles, passions and professions. From fresh menu offerings in the main dining rooms to a new Chef’s Table featuring the local cuisine of Alaska, guests will delight in seafood, such as salmon and crab, and locally inspired dishes. New celebratory beverages will also be served up. Guests will enjoy a mini museum exhibit featuring notable images throughout the 50 years Princess Cruises has sailed to Alaska.